The latest release from EDT Software brings faster processing, smarter analytics, and an enhanced workflow. Version 5.0 provides faster and more robust processing than ever, both in the cloud or on-premises, and delivers an enhanced workflow for analysis and review via the new near-native viewer. Introduction of HTML5 near native document viewer, removing the need to generate images prior to review and redaction. Lightning fast, distributed processing for both on-premises and cloud deployments and support for elastic cloud based computing resources that are able to scale up or down to accommodate peak processing periods. More streamlined and intuitive integration between Processing, Analysis, Review and Administration modules via a single web interface. To learn more about EDT Software and request a demo, contact sales(at)discoveredt(dot)com. 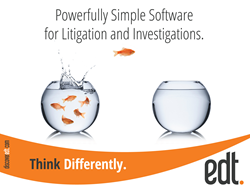 For over a decade, EDT Software has established an international reputation in relation to its full lifecycle software that manages eDiscovery, investigations, and litigation. EDT has been embraced by a world-wide client base including GLOBAL100 law firms, top tier accounting firms, corporations, government agencies, forensic experts, consultants and service providers. For more information, visit http://www.discoveredt.com/.